Download Our Free Report - Improve Your Preshot Routine, FREE! How Can We Help With Your Golf Mental Game? Please contact us at Peak Performance Sports by phone or web form below. 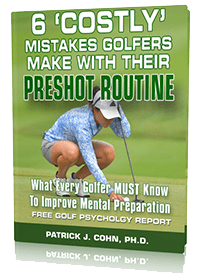 Dr. Patrick Cohn has helped junior, collegiate, and tour professional golfers improve their mindset for golf for over 25 years. If you want to improve your performance via mental training, Peak Performance Sports can help with our unique mental game coaching programs. Our trained mental training professionals have the experience and know how to help you get the most from your physical talents. Do you have a golf psychology or mental training question? Do you want more information or pricing for our mental coaching programs? Do you want to place an order for one of our golf psychology audio programs? Do you want to test out our free 15-minute introductory session if interested in personal coaching? Are You Ever Satisfied With Your Golf Game? How Does Mental Coaching for Golf Work?